Kaitlyn Mooney, who starred at NJ's Southern Regional High School, threw down the greatest 5,000m performance in NCAA Division III history with a stunning and epic victory at Friday's NCAA Division III Indoor Track and Field Championships at the Reggie Lewis Center in Boston. Mooney not only became the first female athlete from the United States Coast Guard Academy to win a national track title, but she took down the Div III national record!!! Mooney's winning time of 16:23.12 broke the Div III record of 16:23.40 set in 2016 by Amy Regan of NJ's Stevens Institute of Technology. Regan ran at NJ's Watchung Hills High. Mooney, who won the 3,200 at the NJ Meet of Champions in the spring of 2016, shaved just over four seconds off her previous school record time of 16:27.30, which was the second fastest Div. III time ever run. 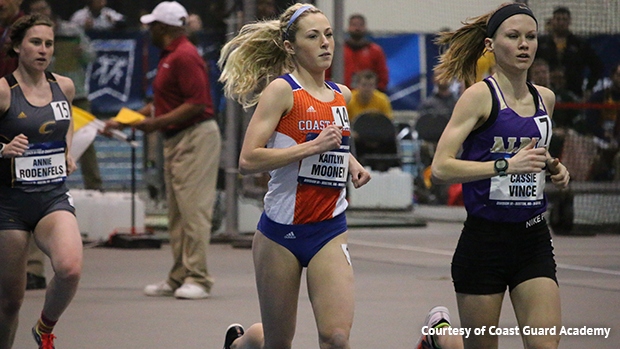 Mooney wasn't finished after her historic victory in the 5K. She came back later to split 4:51.12 on the anchor leg of the distance medley relay to bring the Coast Guard Academy across the line in third place in a school record 11:43.85 to earn All-American status.